Still a free download, even now! 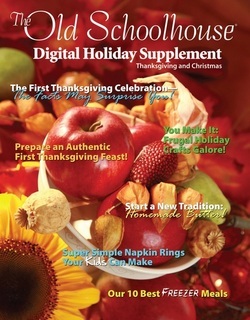 For the last couple of years, "The Old Schoolhouse" magazine has offered a free digital download of their Thanksgiving and Christmas holidays issue for anyone and everyone to enjoy. The 2010 free download is full of 176 pages of beautiful photos, articles, and recipes. The link for the FREE download for the TOS 2010 Holiday Supplement is HERE. While I can't place the articles and recipes here for you on my website, I can provide you with a list of articles and recipes included in the free download. I think you will be very pleased with this beautiful magazine issue this autumn! I hope you'll be able to take advantage of this beautiful Christmas and Thanksgiving issue and download it for yourself. I know you won't be disappointed!